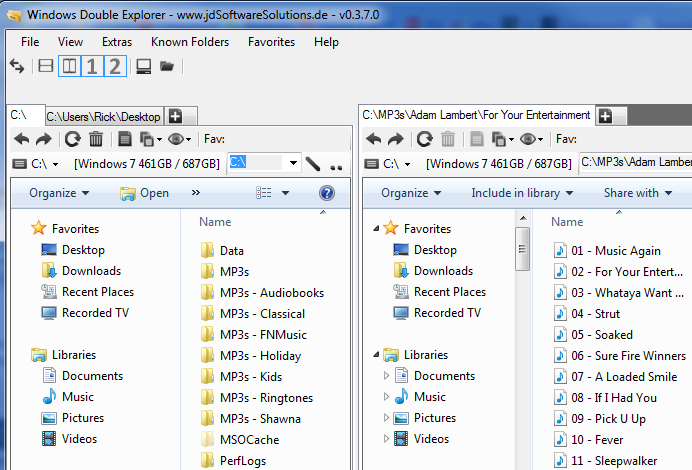 Not long ago I extolled the virtues of using side-by-side Windows Explorer windows to manage files and folders. I still think that's a great way to go, but it does require you to manually open two instances of Explorer, then drag one to each side of the screen (or use keyboard shortcuts for faster Aero Snap snapping). True to its name, Double Explorer employs a dual-pane interface, which you can view stacked or side by side. Within each pane you can create multiple tabs representing different directories on your hard drive. And you can drag any folders to the Favorites toolbar for easy access to them down the road. Novice users will find there's a bit of a learning curve here, as not all the file/folder-management options will make immediate sense. But for seasoned users (and those willing to learn), WDE is definitely worth a look. It's a compact, installation-free bit of handyware that reminds me of the classic Total Commander. One important note: Windows Double Explorer works in Windows 7 only. If you have an older version of the OS, the aforementioned Total Commander is a good bet. Everyone has their preferred method for keeping their favorite sites close at hand. Me, I take advantage of Firefox's bookmarks toolbar, which provides one-click, at-a-glance access to around 20 favorites. Just one problem: Any favorites that won't fit the width of my screen get dumped into a pull-down menu that appears at the far end of the toolbar--rendering them much less easily accessible. Enter Multirow Bookmarks Toolbar, a head-smackingly obvious Firefox extension that lets you add extra rows to the bookmarks toolbar--thus putting more of your favorites close at hand. What's more, you can scroll through your remaining bookmarks, instead of having to drill into that pull-down menu (which, in case you're wondering, no longer appears when MBT is active). Bottom line: If you rely on the Bookmarks Toolbar, Multirow Bookmarks Toolbar might just be your new favorite Firefox extension. It's definitely one of mine. Recently two of my relatives complained of the same maddening problem: They'd be typing along on their laptops when suddenly the cursor would jump, resulting in garbled text or even an unwanted mouse-click. 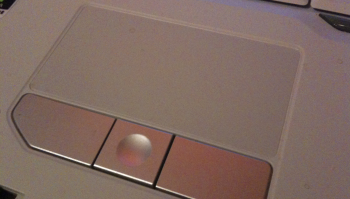 This is usually the result of your thumb or palm accidentally grazing the touchpad. Fortunately, there are ways to combat this problem, usually by tweaking the Windows mouse/touchpad settings. I tested the utility on two laptops, one running Windows XP, the other, Vista. On both systems it worked as advertised: No amount of tapping while typing would actually register a tap. If you've been tearing your hair out due to flaky laptop behavior, this handy freebie may just solve the problem.